Note: The article is written by Dave Bell, CEO of Gummicube. Any and all opinions expressed in the post are of Dave. Brickbats and bouquets can be sent at the contact details in the author bio at the end of the post. The advent of mobile applications actually started in the late 90’s as the first color phones started to make their way into the hands of wealthy consumers. During these days, it was a new experience for consumers to download apps right from the cellular network to their device. Conversely for mobile marketers, it was also the first time that the walled garden of carrier decks started to rear their ugly heads. For those old enough to remember, this walled garden is literally what the internet looks like without net neutrality — the network operators (or internet providers) picking winners or losers. It was the precursor to the charts in the current app stores. As the founder of Chasma, an early mobile games publisher that released hits like Whac-a-Mole, Slingo2Go, and Fox Poker Superstars for feature phones running BREW and J2ME technology, I can remember traveling to each carrier with a roadshow of apps to get a select few placed on deck. Naturally, as more and more apps were added to carrier decks, the ability to get visibility and exposure became more and more difficult. Was placement controlled by personal preferences at the carrier? Are competitors illicitly paying for placement? Are the decisions made at random? This was clearly not the most “fair” model and relationships were critical to success. Today we have the opposite problem — a flood of apps and directory-based discovery that is broken for most developers. When smartphones first became mainstream with the introduction of iPhone, there was suddenly an opening in the walled garden in the form of new advertising networks. Early players in the mobile app market discovered that driving downloads through these networks would boost their chart visibility and short-term download volume which, in turn, fueled a cottage industry of “chart boosting” services to implode. This practice is of course officially banned by Apple and Google and is largely ineffective today because Apple has moved to an editorialized App Store front page, and Google Play is looking at user engagement more and more. Beyond these kinds of tactical marketing methods, ad networks gradually evolved to become more performance oriented. Developers no longer had to pay for impressions, and could pay a fixed rate per download. On the surface, this seems like a wonderful proposition, but the problem is that many of the middlemen in this marketplace are the same former affiliate marketing types who used to arbitrage online ads for horoscope and nutraceutical sign-ups 10 years prior. While this certainly poses many questions about the dubious nature of some install networks, the industry has actually evolved beyond the simple pay per install model. The mobile marketplace has matured very quickly since those early days in 2007 — so fast, in fact, that marketing techniques are just starting to catch up. The first thing that you need to know about this new, more mature mobile marketplace is that traditional marketing channels play a role in the success of most top applications. 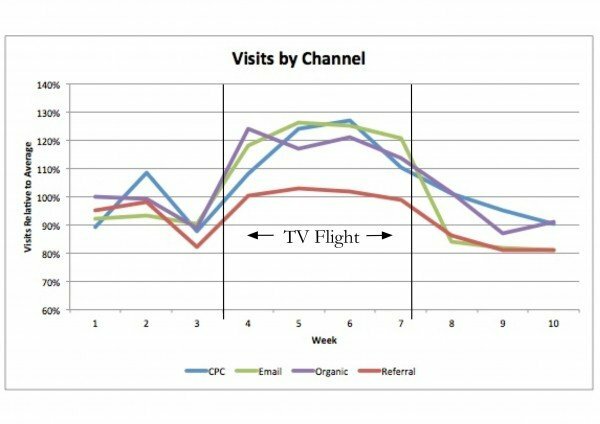 The typical television advertisement causes engagement with the brand long after the conclusion of the ad spot. In fact, according to a study, 25%-30% percent of consumers search for terms related to the brand or product after they see a commercial. It’s no secret that users research apps before downloading, whether reading reviews or turning to Google search. Even though you may get a click on your ad and have attribution tools tell you that your campaign generated an install — the user probably did some research first. In fact, queries researching apps have increased on the web so much that Google is introducing a way to “preview” an app before downloading — right from the browser. Influencers play a critical role in spreading viral adoption of an application, and targeting the right online communities can accelerate the growth of your app. 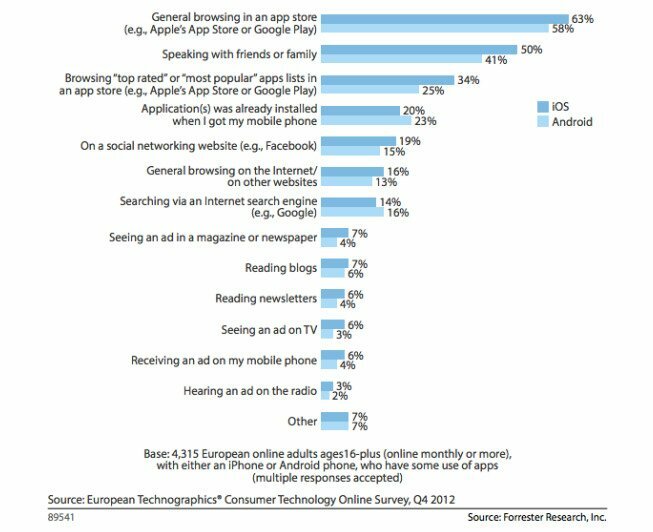 In fact this recent study indicates that up to 50% of users discover apps socially or due to recommendation. Still, many users will search for your app instead of clicking the shared link. The above facts illustrate a marketing ecosystem in which one channel is dependent on good execution of the other for success. Marketers simply can’t “buy installs” nor can they spend massive budgets on television ads without first having their app store optimization in place and professionally managed. Doing one thing without the other wastes money and creates massive inefficiencies in the user acquisition funnel. It isn’t a coincidence that many channels drive users to search for an application. 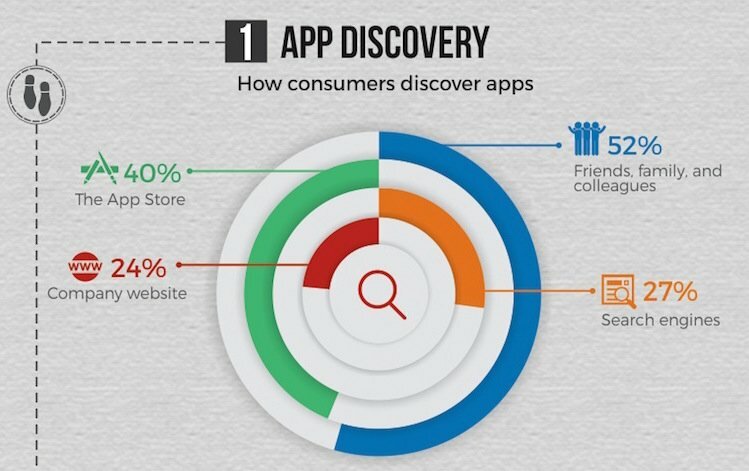 More than 63% of app discovery was driven or assisted by app store search. Likewise, understanding what compels users to choose your app over the many others listed in the app store (or promoted by a network, in the case of paid advertising) is also critical. Google recently introduced the ability to A/B test live in the Play Store and many small startups have invented tools to take advantage of this new feature. The challenge with live A/B testing is that negative tests also negatively impact your click-through rates, which can cause medium to long-term negative consequences in your search rankings. Further, A/B testing alone provides some click-through data but fails to harness insight into why a test may have failed or succeeded. To gather better insight and also ensure that live A/B testing has the least possible negative impact, marketers have turned to focus group discussions with live end users. Using this method, it is possible to have a representative sample of users provide initial click-through data and also real feedback as to what they like or do not like about the on page experience. This gives marketers the quantitative and qualitative data that is needed to make balanced decisions that lead to the success of their applications. Simple changes in the call to action on screenshots or even the colors of icon can increase downloads significantly when tied together with an app store optimization program that can generate visibility for your app page. For example, Gemr, a social application for communities of collectors in the App Store, went through dozens of A/B tests before settling on their current icon and creative. “It is a process that requires patience and iteration. As we continued to iterate and learn from user behavior in the App Store, we were able to see incredible growth,” said Brannen Huske, CEO of Gemr. This was of course combined with selecting the best possible keywords so users could discover the app in the first place. The internet spawned millions of websites, and these businesses, products and platforms varied from disruptive game changers to the other end of the spectrum where affiliate marketers hawked fraudulent offers until they were caught. The mobile world is shaping up in much the same way with thousands of app reskins, copycats and the occasional app that steals from the IP of a major brand without a second thought. This is a true sign of market maturity, but how does one compete in this kind of environment? First, focus on building apps, products and services that are real businesses. Ask yourself what problems you are solving and whether what you are building would stand on its own as a revenue generating company. Second, invest in marketing across a broad range of channels — especially App Store Optimization, content marketing, and building a robust network of influencers who can help push user acquisition for your app to the next level. You can see that it is very challenging to engage in the practices outlined in the second point above unless the first box is also checked. Success in the app stores requires the kind of effort that is reserved for those who come prepared to compete and win across all marketing channels, using all available tools.